Plucked from the shelves of Tesco, the GU37BLKSE marks the return of the once-proud German brand. And first impressions suggest that this return might be a welcome one. 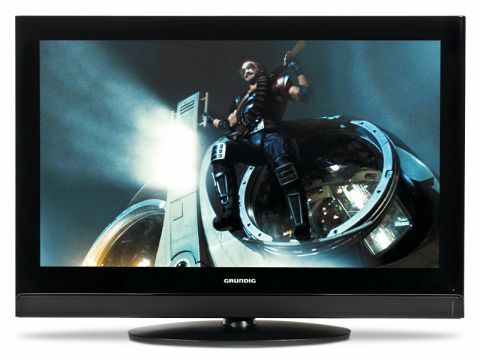 It is remarkably cheap for a 37in TV, and comes closer to being stylish when compared to the other supermarket TVs. It manages two HDMIs where our Ferguson F2620LVD and Goodmans LD2667D entrants only provide one and still also offers a D-Sub PC port. Even more strikingly, it employs one of the slickest onscreen menu systems we've seen. It's even got a few notable features. For, as well as noise reduction and limited colour management routines, the set is the first one here with a dynamic contrast system, where the image's brightness is reduced to improve black levels during dark scenes. As hoped, this system helps the GU37BLKSE produce quite satisfying black levels, with relatively little of the usual grey mist effect. Admittedly, dark areas can look hollow, but this is preferable to the greyness. It also surprises with its sharpness, as it confidently reproduces HD's extra detail, and even makes standard-definition images look decently crisp. Sadly, though, colours look oddly bleached out and flat. Plus, its pictures judder quite a bit when watching 1080p/24p Blu-rays. And sound is completely bass free.